On a cold Tuesday morning in December 2005, Veerendra Shivhare walked into his boss Sanjay Swamy’s cabin and conveyed his intention to quit. As India head of Ketera Technologies, a US-based B2B IT product company, Swamy was leading a team of 100 bright engineers in his Bengaluru office. He knew his men were targets of bigger software product companies. Swamy wondered whether Shivhare was joining any of the global tech majors. “His relieving formalities were completed within three days. If he were to join another tech company, he would have had to serve a notice period,” recalled Swamy, who is currently co-founder and managing partner of investment firm AngelPrime. Shivhare went on to build and sell several startups including mobile ad firm mGinger. Not just he, at least three dozen of his colleagues in Ketera eventually became entrepreneurs themselves. At the last count, there were at least 14 startups that came out of Ketera, including the ones which were eventually bought out by Twitter, Snapdeal and Foodpanda. 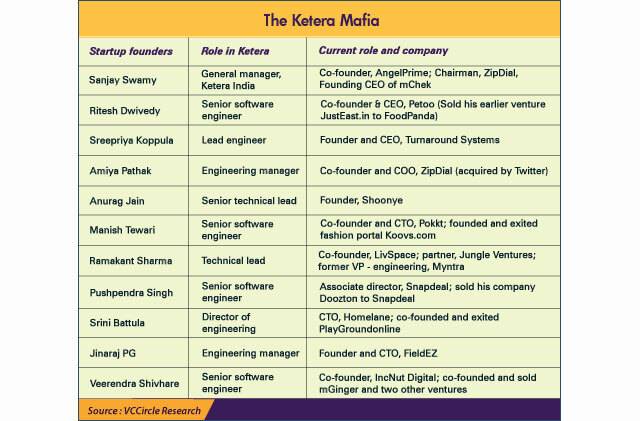 Swamy, who set up Ketera India office and led its operations for two years, call them “Ketera mafia of 2004-06.” And they keep the name of an IT product company which would have otherwise faded into history somewhat alive within the tech landscape of Bangalore. Founded in 2000 in Silicon Valley, Ketera, which used to provide spend management solutions to corporations, was folded into another company Deem in 2010 for an undisclosed amount. “When we built the team, we told the headquarters we did not want to set up another back office. The team we hired could have been a dream team even in Silicon Valley. It was known to be the toughest interview in Bangalore with several rounds. As candidates kept clearing the rounds we kept raising the bar,” Swamy recalled. “They were incredibly sharp people. Of the first 30 people we hired, about 25 left and started their own ventures,” he said. Swamy, who eventually left Ketera, set up payment solution mChek as founding CEO, turned an investor and became chairman of Ezetap and ZipDial. “Back in 2005, the startup culture was not there and we never thought we would see this kind of a proliferation in startups from a small group of employees. But it was clear from day one that most of these people have entrepreneurial bend of mind,” said Srini Battula who was director of engineering at Ketera and later co-founder and CTO of Blume Ventures-backed PlayGroundonline which merged with SportsNest.com. Battula is a founding member and CTO of home décor solution provider Homelane.com. Incidentally, Homelane competes with LivSpace which is co-founded by his former colleague Ramakant Sharma. LivSpace raised $4.6 million in Series A funding from Helion Venture Partners and Bessemer Venture in December last year. “Most of the hires were from IITs and that could be one reason many of us turned out to be founders,” recalls Ritesh Dwivedy, co-founder CEO of tech-enabled food startup Petoo. Dwivedy sold his venture Just Eat India to Rocket Internet-backed Food Panda and joined hands with two others—including Kumar Setu who was his colleague at Ketera—for the new venture. The company is in talks to raise $5-10 million in its Series A round. Just Eat India has its origins in Hungryzone which was co-founded by Dwivedy and another former Ketera employee Priyanka S.
The Indian technology industry has seen great companies emerging out of workplace camaraderie. For instance, IT major Infosys, a pioneering example of first generation entrepreneurship in the country, was founded by N R Narayana Murthy and six others who walked out of Pune-based Patni Computer Systems. In an amoebic expansion of sorts, 10 Wipro employees broke away and formed what is now a $583 million turnover and 14,000-strong Mindtree in 1999, which in turn, saw its cofounder Ashok Soota and 10 others carving out Happiest Minds in 2011. Predictably, IT services industry leaders such as TCS, Infosys and Wipro have seen many tech startups sprouting out from their large workforces. The new generation internet companies are spawning new companies at a far more accelerated pace. It is estimated that 20 tech startups including InMobi, Flipkart, Myntra, Snapdeal, Zoho and Paytm together have a couple of hundreds of progenies. Also, there are other models such as Gurgaon-based Smile Group which has a chain of half a dozen consumer internet companies in which it holds minority stake. “This is inevitably a cycle and it is a healthy thing too,” said Sharad Sharma, co-founder of iSPIRT (Indian Software Product Industry Round Table) about tech companies spawning numerous new companies. “The decent rate of success among these startups is a message to wannabe founders—go and work for enterprises first before becoming an entrepreneur oneself,” he said. What makes Ketera’s history unique is that fact that its employees were enchanted by entrepreneurialism in 2005-06, much before India witnessed a startup proliferation eventually. “Almost 40 per cent of the workforce of a company branching out with different ventures is something not so common,” Dwivedy said.